Have you heard that Amazon has launched it’s own smart security camera and are eager to find out more? In this article, I compare the Amazon Cloud Cam against the Arlo Q and the Arlo Q Plus. The Arlo Q and the Arlo Q Plus are almost identical smart cameras and they in turn look similar to the Amazon Cloud Cam. But looks are one thing and specs and performance are completely different. The age difference between these three security cameras is quite large. The Arlo Q was launched at the end of 2015 whereas the Amazon Cloud Cam was launched two years later at the end of 2017. The Cloud Cam is the lightest camera weighing in at just 142g. You would expect that the newest camera to be the lightest. The Arlo Q cameras in contrast are heavier and weigh in at 168g, but in reality there is not that much difference between them. All three of these cameras use Infrared LEDs for their night vision. The Amazon Cloud Cam has 8 LEDs placed around the lens and the Q and Q Plus have 12 LEDs around their camera lenses. The Arlo cameras have an official range of 8 meters or 25 feet, whereas the Amazon Cloud Cam doesn’t have an official range. 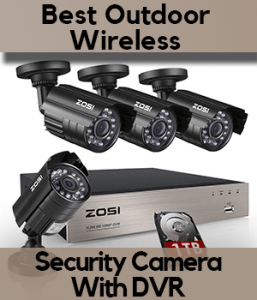 But looking at some of the feedback left by users about night vision, it is clear that it is a much loved feature for all three of these smart security cameras. The Amazon Cloud Cam will record a video clip as soon as it detects any motion. It will send you a notification via the Cloud Cam App and if you have an Alexa device (such as an Echo) the device will alert you when motion has been detected. You can also choose with the Amazon Cloud Cam if you want to receive any notifications at all and how frequently you want to be notified. The sensitivity levels of the Amazon Camera’s motion detection can be altered by selecting “low”, “medium” or “high” from the motion sensitivity settings. The Arlo Q and Q Plus have very similar motion detection capabilities. Unless your Arlo camera has been turned off, it will begin recording a video clip as soon as it detects motion. And you can adjust the length of this recorded clip from 10 seconds to 300 seconds (5 minutes) or you can set the camera to record until the motion stops. Like the Amazon Cloud Cam, the Arlo cameras motion detection sensitivity can be adjusted. Instead of choosing “low”, “medium” or “high”, there is a slider that you move across. A motion zone is a specific area within the cameras field of view that can be created and monitored individually for motion detection. The Amazon Cloud Cam can only use zones if a user is subscribing to the Cloud Cam Plan but you can set up and use motion zones on the Arlo cameras without needing to subscribe to an Arlo Cloud plan. The Amazon Cloud Cam (with a plan) allows a user to set up zones or areas within the cameras field of view that can be ignored as well as creating zones that are monitored. The ability to ignore certain areas is useful, if for instance, part of the camera’s field of view is focused on a window- which you don’t want to be monitored. The Arlo cameras only allow a user to create zones that are monitored not ignored. Arlo users can create up to 3 zones per camera and here is a step by step guide that will show you how! Only the Amazon Cloud Cam has this person detection feature and it is only available as part of the Cloud Cam Plan. Neither the Arlo Q or Q Plus have a person detection feature. It isn’t available even as part of an Arlo Cloud subscription. Some smart security cameras as well as notifying a user when motion is detected will also send notifications for sound alerts. The Arlo Q and Q Plus have this function but the Amazon camera doesn’t. The cameras with the best security features are the Arlo Q and Arlo Q Plus. A combination of good motion detection features, solid night vision performance and separate sound alerts make these cameras a great choice. Perhaps the only weakness is the lack of cutting edge features such as person detection. Just because a camera can record footage at 1080p does not mean that they will at all times. the strength of connection between your camera and your router. All three of the security cameras have digital zoom. Footage can be zoomed in via an app on your phone or smart tablet by just “pinching” the screen. I am not sure how powerful the zoom is on the Amazon Cloud Cam but on the The Arlo Q and Arlo Q Plus a user can zoom in x8. The Amazon Cloud Cam has a field of view of 120° whereas the Arlo Q and Arlo Q Plus have a field of view of 130°. These are very large field of views, and compare well with other very popular smart security cameras such as the Nest Indoor Cam or the Arlo Pro 2. All three of these cameras come with a built in microphone and speaker so that a user who is connecting to the camera via an app can talk to a person who is standing right next to the camera. But what is the sound quality of these cameras actually like? Well, users of the Amazon Cloud Cam are very impressed by the audio quality on this camera. The audio can be turned on or off so that your motion detection clips are recorded with or without sound. In the app on the Live View screen you can start a conversation by tapping and holding down the microphone icon. Users of the Arlo Q and Arlo Q Plus are more mixed in their reactions to the cameras 2 way audio. Most users think that the microphone and speaker work well and that the sound is good quality but there are some who believe that the sound quality is poor. Live stream or live view is the ability to watch a security cameras footage live and all three of these cameras have this feature. A really cool part of the Amazon Cloud Cam’s live view ability is the way that it works with other Amazon products such as the Amazon Echo, Fire TV or Echo Show so that you can use your voice to control the camera and watch it on your TV screen. With the Amazon Cloud Cam, you can watch now connect to your camera and watch live footage using your web browser as well as your smartphone or tablet. The Arlo Q and Arlo Q Plus “live view” feature is also available via the app or a browser- which is great for laptop users like myself. The cameras with the best audio and video features are the Arlo Q and Arlo Q Plus. A combination of very good resolution and large field of view make these cameras a great choice. 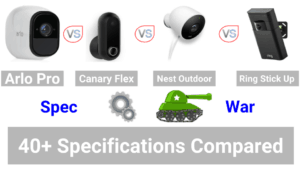 It is in this section that we notice some of the only differences between the Arlo Q and the Arlo Q Plus. None of these cameras is battery powered. All of these smart cameras need a power supply and they all have a USB lead that at one end has a micro USB attachment that connects to the camera and a standard USB adapter at the other end that connects into a “power brick”. For all of these cameras, the lead is about 3 meters. As you can see from looking at a photo of the Arlo Q Plus, it has a large box that an Ethernet cable plugs into. Well, that box is a PoE adapter that allows this camera to be powered by an Ethernet cable instead of a traditional power lead. On this page, I explain a bit more about what exactly PoE is and the advantages of using it to power cameras compared with using a standard power supply. The Amazon Cloud Cam and the Arlo Q cannot not be powered by PoE. Amazon’s Cloud Cam Plan has 4 different plans that vary on how long footage is stored for. The Plans offer storage and extra functionality. All footage is stored for free for 24 hours. The 7 day plan can include up to 3 cameras and the 30 day plan includes up to 10 cameras. In addition with all paid plans are extra features such as person detection and zones. Also there is a free 30 day trial. Finally, Amazon does not offer any CVR (continuous video recording) plans. The Cloud Cam can only be used as a motion sensing camera. Arlo’s cloud storage is very different because it has more options. But the Arlo Cloud only really offers storage and free technical support- there are no extra power features. Arlo has 4 types of plan; Basic, Premier, Elite and CVR. The basic plan offers free storage for up to 7 days. The Premier plan stores footage for 30 days and costs $9.99 per month or ($99 per year) and includes up to 10 cameras. The Elite plan stores footage for up to 60 days and costs $14.99 per month or ($149 per year) and includes up to 15 cameras. There are two types of CVR plan. These turn your cameras from cameras that only record when they sense motion to cameras that never stop recording. These plans are priced per camera. To store footage for 14 days will cost $9.99 per month or $99 per year. To store footage for 30 days will cost $19.99 per month or $199 per year. The first big difference between the Arlo Q and the Arlo Q Pro is that the Pro can use PoE as an alternative to a standard power supply. 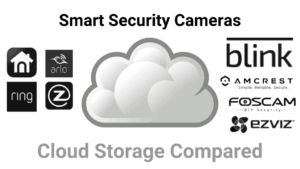 The second difference is that the Arlo Q Pro can store footage locally on the device using a micro SD card. The micro SD has to be class 10 or higher and be no more than 128 GB in capacity. The Arlo Q and the Amazon Cloud Cam can’t use a micro SD card to store footage. The camera with the best power and storage features is the Arlo Q Plus. Having two different methods for being powered and being able to use micro SD cards makes this security camera a very strong choice. If you want to connect your iPhone or iPad to the Amazon Cloud Cam, then your device needs to be running iOS version 9.3 or later. If you want to use your iPhone or iPad to connect to either of the Arlo security cameras, then iOS 8 or later needs to be running. The Amazon Cloud Cam will only work on smartphones and tablets that are running Android 5 or later. For the Arlo cameras, these Android devices need to be running 4.1 or later. FireOS is the software that powers Amazon devices such as Fire Tablets and the TV sticks. All of these cameras are compatible will FireOS devices. The Cloud Cam, Arlo Q and Arlo Q Plus can all be accessed via a web browser. There was not much difference between all of these cameras in this section. Essentially, the Amazon Cloud Cam requires more recent versions of iOS and Android in order to work. The flip side is that by requiring slighty older versions of the iOS and Android operating systems, the Arlo Q and Q Plus will work on more phones, which in my eyes makes them a better option. It is no real surprise that all three of these smart cameras are compatible with Amazon’s digital assistant, Alexa and the interactive devices that she is part of! What is a bigger surprise, is how poorly this camera integrates with other top smart home systems. Now, this is either a stroke of genius from a company that is convinced that it will dominate the smart home market and so, why be compatible with any other systems?! Or it is a sign of complete foolhardiness as the lack of compatibility with other systems will severely limit the number of potential buyers. The Amazon Cloud Cam doesn’t work with Google Home, HomeKit, Wink or SmartThings. The home automation powers of the Q and the Q Plus are far more impressive. These two cameras work with all the top smart home systems apart from Apple’s HomeKit. They will even work with IFTTT (If This Then That) which is the secret sauce of any smart home! There are no surprises here as the difference is massive. The winners are the Arlo Q and Arlo Q Plus because they are much more compatible with other systems. All three of these smart cameras connect directly to your WiFi network and don’t use smart hubs. Amazon Cloud Cam can only connect to 2.4 Ghz networks. The Arlo Q and Q Plus connect to 2.4 Ghz and 5 Ghz. The Amazon Cloud Cam and Arlo Q do not have an Ethernet cable, whereas the Arlo Q Plus uses PoE. The Amazon Cloud Cam is the only one of these cameras to use Bluetooth. Bluetooth is used to connect your smartphone to the camera when you are setting it up. 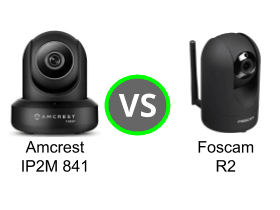 The fact that the Arlo cameras work with 2.4 Ghz and 5 Ghz WiFi networks makes them worthy winners of this section. All of these cameras are only available in white. They are only designed for indoor use. All of these cameras come with a standard 1 year warranty. In this section there are no winners as I think that all cameras are equal. Looking back at all the section winners, the overall winner for me is the Arlo Q. The Arlo Q and the Arlo Q Plus are in almost all respects the same camera. And so why aren’t they both joint winners in this comparison? Well, that is because of the price difference. The Arlo Q Plus is much more expensive than the Arlo Q.
Don’t get me wrong, the Amazon Cloud Cam is a great security camera but I think that the Arlo cameras are far more capable. Price | Design Looks Dated? A great camera for the price. Are you an Amazon Fanboy? Buy It! This is a great, all round camera with a rock- solid performance. It will work in a variety of "smart homes". Like its brother, this camera is impressive. The higher price tag is because of its PoE adapter which makes it an attractive proposition for businesses. Arlo Pro vs Arlo Pro 2: Should You Upgrade? Arlo Camera- But Are These Netgear Cameras Smart Enough?